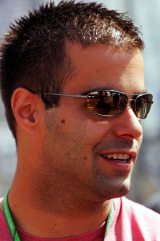 Zsolt Baumgartner was Hungary's first Formula One driver who raced for Jordan and Minardi in two unmemorable seasons. He made his debut for Jordan in 2003, racing twice, and appeared set to continue with them after he won support from an oil company. But he was unable to agree terms and instead moved to Minardi, securing the team's first point in over two years when he achieved a career-best eighth at the US Grand Prix. He continued to race away from F1, and in 2007 was the test and reserve driver for Minardi Team USA in the Champ Car World Series.